Kyalami Estates is one of the earliest examples of a development enclosed by a security wall with 24-hour controlled access, but it is more than that, combining all the benefits of urban convenience with the tranquillity and space of a rural environment thanks to extensive parklands and a natural wetland. 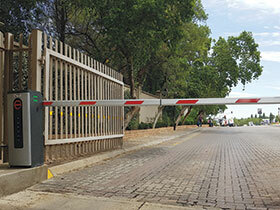 Genius Rapid Barrier is more than just your normal access barrier: indicating robot on barrier door, indicating LED light on the barrier arm (optional), over-all high speed operation of the barrier as well as the stylish design, are just some of the amazing features available on offer from Boomgate Systems. Barrier is available in both left and right hand parameters and lengths ranging from 2 m to 6 m.